Results to Date: Shortlisted for Spider Web Design Award, 95% Homepage Download Speed on Desktop and 89% Mobile. Incredible SEO Organic performance, position one for keyword strings such as: Career Guidance Cork, Career Guidance Limerick, Career Guidance Meath, Career Guidance Sligo, Career Counsellor Dublin and top three for Keywords such as: Career Counsellor Dublin, Career Guidance for Leaving Cert Students, Career Guidance Ireland, Career Help, Career Guidance. Over 1000 Keywords Indexed and 400 Backlinks to the site. 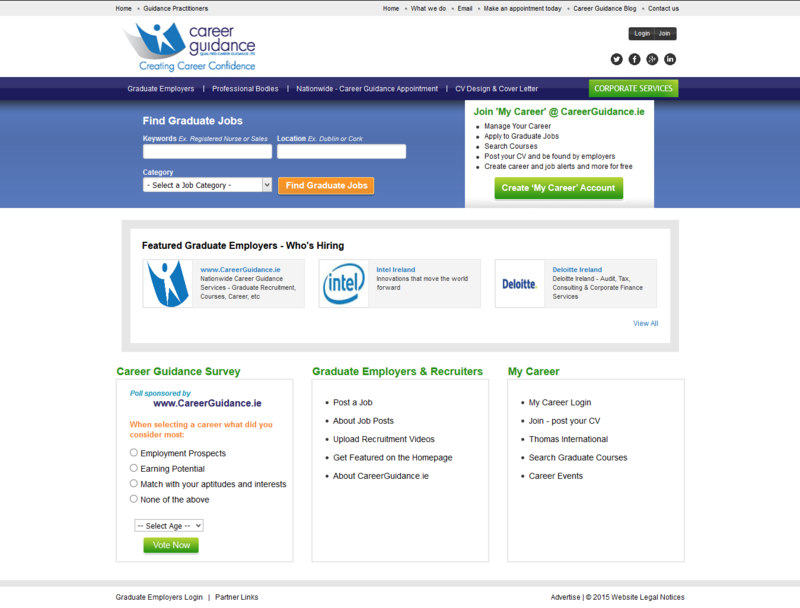 Company Description: www.CareerGuidance.ie - The only website in Ireland where you can make an appointment to see a qualified and impartial career guidance practitioner. Offering students a full My Career functionality, Graduate Recruitment and a catalog of Graduate Courses. Objectives: Complete Graduate Recruitment Software development - My Career end user functionality, guidance practitioner client management system and Thomas International API integration. UX, Software Development and HTML5 Upgrade.